In the middle of February, my husband and I ministered to a city that’s quite far from our city. We drove on the highway along 780 km, across three provinces and around 20 big and small cities. It was really fun. Then on Sunday afternoon we traveled home after two days of service. The highway was wide and quiet, the sun was bright, so perfect. But we cannot continue to enjoy that comfort. Half the trip had passed when we saw a thick lump of black cloud covering the sky in front of us. The color of the black clouds with the golden glow of dusk showed contrasting scene. Beautiful but also frightening! Moments after I captured it with a cellular camera, apparently our car began to enter the area under the black cloud. The rain immediately flushed and the longer the more heavy accompanied by strong winds. The heavy rain, the strong winds, and the darkness of the night, made our visibility very limited. A comfortable journey turned to full of suspense. The lighting on the highway that we passed is only at the interchange, namely in the area before and after the gate of highway. Along the rest of the road there are only traffic signs and small plates at a certain distance that function as reflectors. The yellow reflector on the guardrail separates our lane from the opposite direction, and the red reflector on the guardrail on the edge of the highway. For hours traveling in the dark night accompanied by the roar of the rain and strong winds we only relied on traffic signs and luminescence from the reflectors that reflected the lights of our cars. And even then only a few meters, limited to the distance of the lights of our car. Those points of light were the guide for us, whether the road we are going through will turn left, right, straight, down, or uphill. Meanwhile, our windshield wipers were competing with the rain that forms a kind of water curtain covered the windshield, making the view more blurred. Many times we have to lean forward so we can see the signs and the road more clearly. We must pay attention to and ensure that we follow each sign directions correctly because a little mistake make us misdirected. For me, the situation we experienced at that time described a phase in the journey of life. There are times when everything goes very pleasant, comfortable, safe, easy, and smooth. There is also a time when problems come, like clouds cover the sun and change the light to dark. That is the dynamics of life that can be experienced by anyone, whether in extreme forms or only wavelet. The characters in the Bible also experience times when they have to walk in dark valleys. Moses, a Hebrew who was educated and lived in the palace of Pharaoh, had experienced the phase of becoming a fugitive and had to live in the house of a priest in the land of Midian for fear of being killed by Pharaoh (Ex 2: 11-22). Joseph, a favorite son who was given a tunic of many colors by his father, also experienced several times the ups and downs of the dynamics of life. Starting from being dumped to a well and sold to Egypt, then got a position as a trustee of Potiphar, but then being imprisoned for being slandered (Gen. 37: 12-36; Gen. 39). David, a worshiper of the Lord, experienced the extreme dynamics of life from a sheep shepherd who was suddenly anointed to become king, then became the person trusted by King Saul. But then the situation changes. David became Saul’s main enemy until he had lived on the run for several years (1 Samuel 16-30). Then when he became king as God promised, there was a treason led by his own son until he had to flee from his palace (2 Sam 15-17). Those are three of the many stories of the characters in the Bible. Their experiences differ from one another but there is one common thread, namely obedience. They were people who remain obedient to follow the guidance of God even though they are under pressure. They didn’t deviate from the provisions of God, didn’t compromise with sin, and remain faithful to do what is right in the midst of their plight. In the end, it obedience brought them into fulfillment of God’s plan and made them reach the finish line brilliantly. God has a special plan for each of us and He has provided everything needed so that we can work on His call, but it can only be realized if we obey Him. Obeying God’s guidance in the midst of dark times has its own difficulties. Like walking in the rain on a dark night, heavy pressure can make us unable to see everything clearly because we panic, worry, fear, stress, depression. Our feelings become uneasy so it is difficult to pray. The desire to get out of trouble quickly makes us impatient waiting for God’s help. These various psychological conditions can make our spiritual eyes unable to see clearly and our spiritual ears become insensitive. We can be tempted to take shortcuts and seek help in our own way. When we finally choose to follow our own will, we will be misguided, because what we think is good is not necessarily good and what we think is right is not necessarily true. Solving problems in our own way at first often seems successful but we don’t know what will happen at the end of the road. Obeying God’s guidance is the only way if we don’t want to get lost and regret later on. Knowing God’s guidance isn’t complicated. God has provided complete guidance for us, namely the Bible. The Bible is the written word of God. Following God’s guidance means doing what is written in the Bible. The Word of God is like a traffic sign that shows direction and is like a light that illuminates our path. If our lives are on a dark road, just do what the Bible says even though it’s not directly related to the problem we are facing. Obedience to God’s word will make us smarter, wiser, and more understanding, even beyond knowledgeable and experienced people. We really don’t know the whole of our journey. Be obedient, because every obedience to the word of God will take us step by step to the way out of our struggle. The wisdom and understanding that comes from God through His word will enable us to view problems with the right perceptions so that we can make the right decisions. Moreover, every obedience to the word of God will change us day by day to become more and more like Christ. We cannot totally obey Him if we don’t believe in Him. Moses, Joseph, and David were people who obeyed God’s guidance because they were believe in God. Moses could have kept hiding and refused to be sent by God to meet Pharaoh, but Moses chose to obey. Moses obediently worked on God’s call to lead millions of Israelites across the desert with the pillar of cloud by day and the pillar of fire by night. When the pillar of cloud and the pillar of fire stop, he stops. Where the pillar of cloud and the pillar of fire move, there he follows. Joseph could have complied with the wishes of Potiphar’s wife, but he chose to run away from her because he knew that it is sin. Joseph also had the opportunity to take revenge on his brothers who had made him suffer, but instead he gave them a place to live and fulfill their needs because he knew that God had a special plan for his life in Egypt. David had more than one chance to kill Saul, but David did not want to do it. Actually, if he killed Saul, he would easily occupy the position of king, but he chose patiently to wait for God’s time. Moses, Joseph, David, and the people used by God in the Bible are people who fully believe in God. They don’t put their secure feelings into the situation. They don’t entrust their future to experiences, skills, connections, position and wealth. 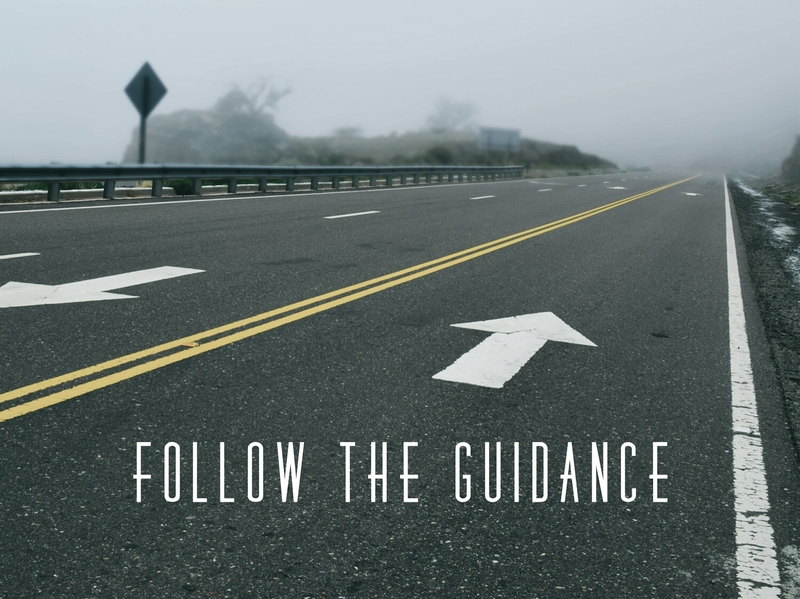 They don’t make decisions based on their own passions and considerations, but they follow God’s guidance even though sometimes for a moment it seems that their obedience doesn’t make things better. They still believe in God and rely on God in all circumstances, good or bad. Dear brothers and sisters, if we are in a bad situation, remember what David did when he was greatly distressed in Ziklag: “David was greatly distressed because the men were talking of stoning him; each one was bitter in spirit because of his sons and daughters. But David found strength in the Lord his God.” (1 Sam 30:6 NIV). Let’s strengthen our trust in God. Not with our own strength but with the help of the Holy Spirit. The Holy Spirit will enable us to faithfully step in to follow God’s guidance. Not only until we get a way out of our problems, but until the end of our lives. Amen. This entry was posted on March 25, 2019, in Christianity, Thought and tagged believe in God, Bible, Christ, christianity, David, devotion, faith, faithfulness, follow the guidance, God, God's word, guest post, Holy Bible, Jesus, jesus Christ, Joseph, Life, moses, obedience, obey, problems, proverbs, Psalms 119, reflection, spiritual, the word of God, trust. As believers, prayer is like an entrance to a hopeful path, that along the way we can get answers to all the struggles. In every hope we bring to God, the happiest thing is if God gives us what we ask for. But the fact is we do not always get what we want, even if we plead with tears!!! Many of God’s children pray for years of asking for miracles, but are instead faced with the opposite of their hope. While at the same time there are children of God with similar problems rejoicing in receiving the miraculous help from the hand of God. If we are in such a position, can we still trust God? Can we still believe that God is good while our situation seems to deteriorate? What is wrong? Do we lack of faith so we failed to obtain what we “believe in”? Do we still keep certain sins so that our answers to prayer are hindered? Before drawing a conclusion, let’s learn from some of the stories in the Bible. Hananiah, Mishael, and Azariah, were descendants of the tribe of Judah who were brought to Babylon when king Nebuchadnezzar conquered Jerusalem. In Babylon, they were part of a chosen Israelite who was educated for three years and then worked for the king. Although they received special facilities from the king’s palace, they did not defile themselves at all. They were committed to always worshiping the God of Israel. God gave them knowledge, intelligence, and wisdom, which made them ten times smarter than all the magicians and astrologers in Babylon (Daniel 1:20). So the king promoted them to sit in government. Then came the time of their faith and faithfulness to God was tested. Shadrach, Meshach, and Abednego believed that God was able to deliver them. But they also said, “IF NOT”. “If not” here was not “if God was not able” but “if God was not deliver them”. Whatever happens they will still worship God and will not bow down to the idol. The statement stakes not just losing their reputation, position, and wealth, but their lives! That’s not a fictitious belief. Their faith was pure, without falsehoods. The result is… The furnace was heated seven times more than usual, killed three men who took up them, but Shadrach, Meshach, and Abednego walked with the angel of God in the midst of the fire without the slightest burning. Even the smell of the fires was not on them, as if a serious problem that just happened did not really happen to them. What an amazing faith that has been responded by God with a miracle that escapes them from the death. God always responds to faith. Great things are always born from the prayers of the righteous that based on faith. Strong faith will not easily falter although “IF” God do not help. But one important thing we must ponder: Could God not help His children?? Impossible! God MUST help us because God loves us so much. It’s just His way that is not always the same as we want it to be. “And he did what was right in the sight of the Lord, according to all that his father David had done.” (2 Kings 18:3 NKJV). When we read the books of Kings and Chronicles, we will find many similar sentences. Several times the Lord mentioned David’s name as a benchmark for kings who did what was right in His sight. Even in the New Testament Jesus is called the son of David: “The book of the genealogy of Jesus Christ, the Son of David, the Son of Abraham.” (Matthew 1:1 NKJV). Even farther: “He raised up for them David as king, to whom also He gave testimony and said, I have found David the son of Jesse, man after My own heart, who will do all My will.” (Acts 13:22). All these statements show how God pleased David. But… If the prayer of a man who is pleasing in the heart of God will always be granted by God?? One day the son of David with Bathsheba was sick. For many days David fasted, prayed and cried for God’s mercy so that his son was healed. The result is his son died. Whether David disappointed? DURING THERE IS A CHANCE… That while his son was alive, David did not lose hope. He prayed, fasted, and believed that his son was healed and lived. But when reality differs from his will, David is not disappointed. He still worshiped God and even entertained his wife. 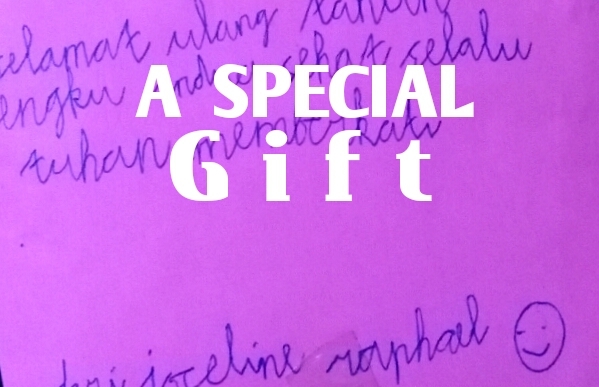 With such extraordinary spiritual qualities, why did not God give according to his prayer? Was David “lacking of faith” so that he did not get what he was praying for? Certainly not! Faith is not measured from “the outcome of faith”. We do not put faith in “the conviction that something we ask for we must have”, but we put faith in the person of God Almighty who can do everything, no matter whether God will do what we ask or not!!! If we put faith in “the outcome of faith” or answer to prayer, then our faith will easily waver if God does not grant what we pray. True faith means believing in the LORD’s PERSON and not only ON THE WORKS OF HIS HAND! If God chooses not to do what we ask, it does not mean that God is incapable and does not mean that we are lacking of faith, but because in His omniscience God knows what is better for us. Keep hoping and praying in faith while there is still a chance. Do not give up! Keep believing and do not be disappointed whatever the outcome. There is always “a hidden blessing” behind every problem and God’s plan is always more beautiful beyond our expectations. The two stories above illustrate a prayer based on firm faith. Faith is not wavered by any answer of God. What about us? We know that God always answers prayers. If God answers “YES” we will get what we ask for. When God answers “No”, it means God does not grant our request. And if God has not given an answer, then we must “WAIT”. Until when? Only God knows. We must be patient and keep faith because in times of waiting all possibilities can happen. But do not worry. Though the problem persists and seems to be more complicated, God always keeps us and is in control of everything. So what if after waiting, it turns out the answer is “no”? If God finally answers “no”, why wait so long? The answer to prayer is always related to God’s plan. We can only measure from the life we have lived and from the planning that we think is good, but God sees our whole life from beginning to end. If God allows anything to happen it means God is working His plan in our lives. Many times we could not understand of God’s ways. All we need is to believe. Believing that God is good, believing that God works together in all things to bring good to us as written in Romans 8:28. Time and answer of prayer are God’s sovereignty. We can not force faster or slower. We can not question why one prayer is answered “yes”, the other is answered “no”, and another prayer “wait”. Whatever the answer of prayer we receive, that is the best gift from God for our future. If we truly believe in God, we must submit to His will and not impose our will. In the struggle of the Lord Jesus in the Garden of Gethsemane, He set an example of prayer for all of us: “And He said, “Abba, Father, all things are possible for You. Take this cup away from Me; nevertheless, not what I will, but what You will.” (Mark 14:36 NKJV). That is a prayer based on true faith. True faith always SUBJECT TO THE WILL OF GOD. Do not ever assume and treat God like a vending machine that once we put the coin into the machine and we simply press the button of the stuff, then immediately we get what we want. We can not force God to make Him willing to obey our will. Precisely in submission and surrender to the God’s will is reflected the real of our quality of faith. Right now, let us ask the Holy Spirit to light our hearts. If indeed we still have sin, let’s ask God for forgiveness. Let us settle our relationship with the Father so that we may know Him better. The Father’s heart is good and always wants to help His children. Everything we need has been guaranteed by the Father. He knows everything more than what we want and need. If the answer of prayer we receive is not what we ask, then God is preparing for something more beautiful, more noble and eternal. Do not measure the goodness of the Father solely from the deeds of His hands. Do not doubt and question His answer. He is too wise to do wrong. He is too good to do evil. If we do not understand His plan, if we can not see the deeds of His hands, just TRUST HIS HEART. He loves us so much. There is nobody wants to live in an ordinary or even futile life. In the deep down of their heart, everyone wants to be successful and reach the highest point in their lives. But the reality isn’t always like what we dream of. Many people get success but not least have failed. But there are some people who are in the midst of their great achievement still feel missing something. They have an impression that they supposed could be more optimal than the current life, optimal in a positive impact and to be a blessing to others. If life is like a train … Whether we are on the right track and the right direction to achieve the goals that God has prepared before?? One of the driving factors for the accomplishment is a PASSION. If our passion IN HARMONY AND IN UNITY WITH GOD’S PLAN, then there is nothing could hold us to live beyond our limitation. As in the image of God’s creation, humans equipped with intellectuality, ability, and talent. It all enables people to do many things in appropriate with capacity and willingness to work hard. But among all that we do, there must be specific things we love, we want, and we dream of. A great desire that come out from the deepest of the heart to do and pursue something, and encourage us to live in, it is called PASSION. Passion makes us “alive”. Without passion, we would just like a machine who doing something over and over, but without “the life” in it. Passion gives us energy and strength to do the best, keep focus, and doesn’t give up easily. Passion makes us happy to work with and without compulsion. Passion even makes us willing to sacrifice many things so what we yearn for will come true. Although some people may not realize what their passion, each person certainly have a passion. So we are. And as God’s children, we also know that God has a special plan for each of His children. The question is whether our passion in harmony with the Father’s plan?? If right now what we are pursued or what we live has been same with the special Father’s plan, it means we are on the right track and in the right direction. But if not, we will have inner turmoil because the spirit within us can be satisfied only when we live in the special plan of our creator! Then how to make our passion in harmony with His plans? 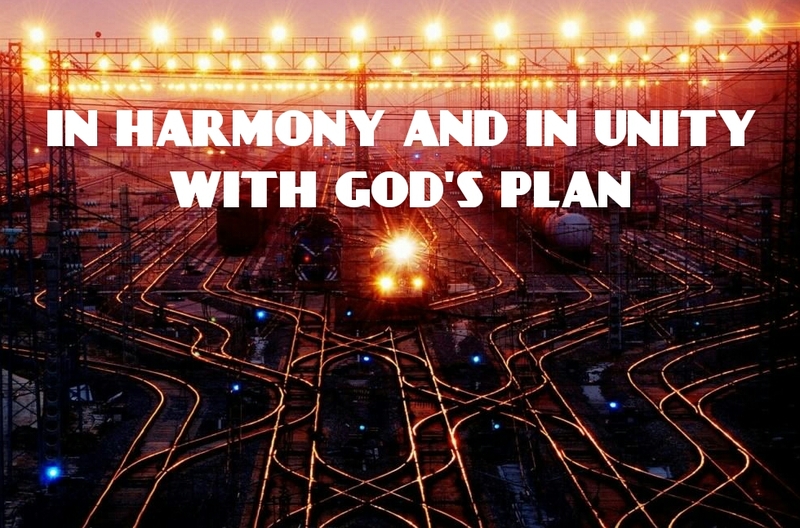 What should we do that our in harmony and in unity with God’s special plan? The only way so that humans restored, go back to the initial quiddity that is live in an intimacy with God! In this case we already on the right way because we believe in Jesus as the only Lord and Savior. However, although we have opened our heart to Him, God will never pervade us, yet God wants to build an intimate fellowship and fill us with His Holy Spirit. It means there are two persons in this fellowship. That is God and us. 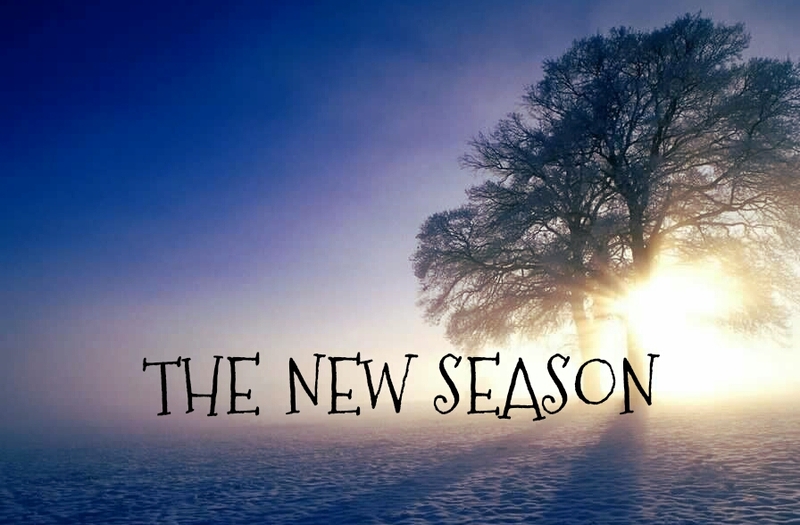 In our fellowship with God, actually we are being changed to become more like Him. The goal is we can live in His fulfillment plan, namely when we were created by Him. In this process, we need a willingness to surrender and obedience to do His word, including submits our passion under His will. Longing of every God’s child is to know the Father and understand His will. But on the other hand, we also have our own dreams and passion that unknowingly sometimes contrary to God’s plan. What I mean of contrary isn’t the meaning of sin, but what we pursue isn’t same with God’s perfect will for us. For example, we really want to become a successful entrepreneur but actually God wants us to take the other profession or the other way. If our dream and passion is still on our prayer and pondering, let’s learn to surrender it all to the God’s hand and obey His decisions. Isn’t so easy to let go our dream and passion especially when we struggle to achieve it, we have risked many things. We will feel a part of our heart gone. However, please believe me within our surrendering and obedience to God there is always blessing and Glory from God alone. The future that God has created for us is more beautiful than our own plans. However, if right now we live our life in accordance with our passion and after long time we realized that God calls us to live in other way, it isn’t easy move on instantly. There is a responsibility must be completed. We have to experience consequences. But don’t be afraid and worry because God is able to do anything. To know God is so important. Increasingly we know God’s heart, will be easier for us to believe Him. When our faith is growing, and then will be easier for us to surrender and obey to His will. Further, the Holy Spirit will guide and show us what we have to do. There will be no vain life process in the Lord. Every single detail of live we have lived, though even it was a mistake, all of that still can be “raw materials” for God to change our future if we are always surrender and obey to Him. Therefore we must be shaped and changed so that we are more and more in harmony with him. Life with maximum achievement can only be achieved if we live in God’s will. Like a train, the train could only travel at the maximum speed and arrives at the right destination when in the RIGHT TRACK / RAIL and RIGHT DIRECTION. For that we should be harmonized with God. Harmonization is a process that must be happen in the fellowship with God. We are harmonized with God in all things. We have to harmonize in personality, character, the way of thinking, lifestyle, life goals, priorities, and so on. More we cling to Him and obey to His word, we will be more in line with Him. The more we know him intimately, and then we will have His heart and mind. So from time to time our passion will be IN HARMONY AND IN UNITY WITH GOD’S PLAN because we have been transformed into more and more like Him. In each process, the Holy Spirit works to change and renewal from the deep of us. Holy Spirit works FROM THE INSIDE of us. Holy Spirit is a helper that gives us strength to surrender, perseverance to be obedient, and courage to walk into the Father’s will. Then like on the right track train and on the right direction, we will reach the goal by goal that God has planned before. If right now you are currently living in your passion and you know for sure that it is according with God’s will, then perseveres in prayer and still hoping until your dream becomes a reality. Challenges will always there. But don’t ever give up. God is always being there beside us. There is nothing can stop us. Keep walk in faith and live in intimacy with God. Always surrender and obey to God, and make sure your passion is always in harmony and in unity with God’s plan. While doing our part, keep the dream and the passion was still burning. Continue to live in it and do everything in love to the Father. Maybe at first looks nothing special and ordinary, be patient and remain faithful! If it is God’s will, sooner or later will bear fruit! Note: Dear readers, just because of Karina still focus on her daddy’s health, so by Karina’s permission this post uploaded be myself (Sella Irene). And for this time comment and like are disabled. Hello my dear readers! I am happy could come back to the blog with my own post and I am grateful to God in the middle of my busyness this evening I could write something to share. I smiled but suddenly remembered about the story of Jericho wall (Joshua 6:1-27). As we all know the Jericho wall destructed by the irrational and unique ways. After spending forty difficult years wandering in the desert of Sinai, they came to the eastern banks of the Jordan to take the Promise Land and they were facing first obstacle. The City of Jericho! Jericho city was surrounded by virtually impregnable thick massive stone. But Jericho wall was successfully destructed (seemingly) by a foolish strategy. This was a strategy that given by God to Joshua: All men of war and seven priests that bear seven trumpets of rams before the ark must around the city once a day for six days. On the seventh day they shall march around the city seven times, and the priests shall blow the trumpets. When the sound of trumpets sounded they must shout with a great shout and the wall will fall down flat. (Joshua 6:3-5) Like most war stories, normally a giant fortress could be destructed only by enormous military force with all its weapons. But in fact, Jericho wall destructed not by military strategy and force but by beyond the logic supernatural power. My beloved readers, in this post please allow me to share two valuable things that I learned from Jericho story. I hope and pray it could be a great lesson for us and could be applied in our lives. Here, faith and obedience plays an important role so Joshua and his people got victory over Jericho. We can see the obedience manner of Joshua. I imagine if only Joshua didn’t obediently follow God’s instruction, I strongly believe the Jericho wall wasn’t necessarily collapsed and the Israelite will never enter to the Promise Land. Why Joshua and his people could be obey to do God’s command? The answer is because they have faith. 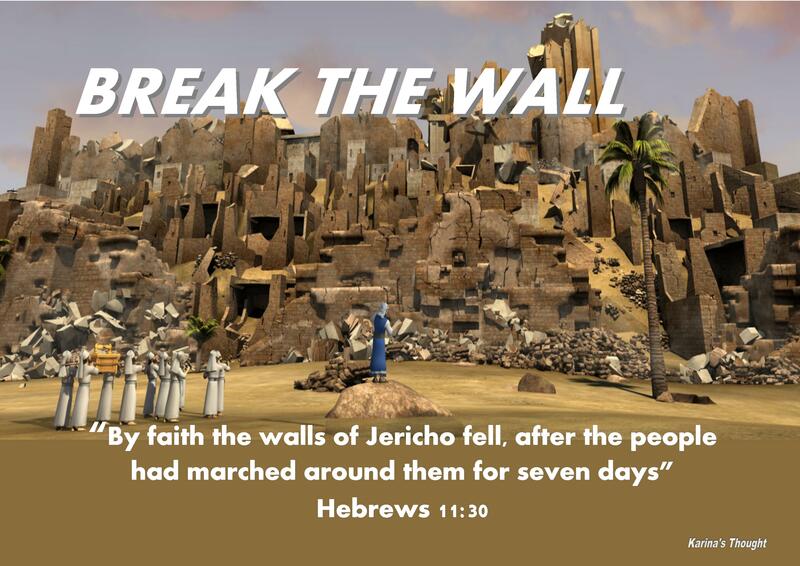 It is written in Hebrews 11:30, “By faith the walls of Jericho fell, after the people had marched around them for seven days” although in the past Israelite’ faith had frequently failed, at the time by faith they believed and trusted God and His promises and they did God’s command obediently. It means they saved by faith and their faith evidenced by obedience. Here we can learn something important. When there are so many hurdles and problems in our lives and God give instructions that seemed doesn’t make sense to do, let’s accept the instructions by faith and do it obediently. It is written in Deuteronomy 13: 4, “It is the Lord your God you must follow, and him you must revere. Keep his commands and obey him; serve him and hold fast to him”. We must remember that God can use anything even the most unreasonable thing to declare His unlimited power. There was so much evidence in the Bible God showed His power through the irrational ways and beyond the range of human logic. God is never wrong. Any God’s instructions and commands has become a part of His plans and God’s entire plan is plan to prosper us and plans to give us hope and future, even not to harm us. (Jeremiah 29:11) We just need to trust by faith and obey it as our real deed. The scripture says that “Faith without deeds is dead” (James 2:26) Joshua and his people showed their faith through deed by obey carried out God’s command and conquered Jericho and God fulfilled His promise by gave them victory over an enemy that was trying to keep them out of the Promised Land. “For My thoughts are not your thoughts, nor are your ways My ways,” says the Lord. “For as the heavens are higher than the earth, so are My ways higher than your ways, and My thoughts than your thoughts. I would like to take you to imagine the physical condition of Jericho wall. I am so sorry couldn’t take much time to explore deeper to find out the authentic information about the size of the wall. Below is the specification of the wall that I got from my father’s Bible archaeology books. Let’s take time a moment to imagine it. Jericho was surrounded by a great earthen rampart with stones retaining wall at its base, the size of retaining wall was around 12-15 feet high. On the top of that was 6 feet thick of mud brick wall and 20-26 feet high. There was similar mud brick wall on the crest of the wall with around 46 feet high above the ground level. Other archaeological discovery stated that Jericho wall consists of 2 layers. 6 feet thick on the outside wall, 12 feet thick on the inside wall, and the distance between outside and inside wall was around 12-15 feet. My dear friends, no matter about the size and construction, by human logic and reason this wall was very difficult to penetrate even impenetrable. If it can be, as I said before the wall must be destructed by very enormous military force but the fact Jericho wall was destructed didn’t by military weapons force but even by the very unique way. Dear, friends. What about us now? If this time you and I are surrounded by “thick wall” of problems of life? Is there a “giant wall” that hinder God’s promises and blessings get into our lives? Whether we want to break it down but we don’t have enough power? This evening allow me to encourage all of us to learn from the Jericho story. Thousand years ago God showed His amazing way to tear down the Jericho wall. So it’s with us today. God will provide the amazing way to break our “Wall”. God will give us victory over the “enemies” that we face throughout life. Let’s ask to the Lord to show His miracle ways. Let’s hear His instruction heartily, accept it, believe it by unwavering faith and do it obediently. By faith, let us bear in our hearts and minds that there are no walls as thick as anything that cannot be break if God pleased. Don’t ever under estimate God’s way because actually He is the way (John 14:6) and our ways aren’t His way. Don’t ever rely on our own thoughts because His thoughts aren’t our thoughts. There is nothing impossible before God (Luke 1:37) and God does His best work in impossible situation. Almost every day before go to the office I always hear a live piano music that played by my little foster sister, Sandra. One day, I spent more time to watch her plays her beloved white grand piano. I am amaze watch her fingers sprightly pressing each piano keys. While I enjoying a beautiful piece of a classical music, my eyes stared to a series of piano strings that hit by small and soft hammers. To could produce beautiful notes, piano strings must be hit. There are times the strings hit one by one but also there are times some strings hit at the same time. There are times the strings hit softly but often hit very hard. Don’t know why when I saw the piano strings, suddenly I am thinking about my personal life that recently is like piano strings . Lately I hit by some serious problems that come at the same time. One of my big problem was that I have shared in my previous post (They Could Find no Charge) I feel being in a situation like a tangled thread that very difficult to disentangle, also it seems I am walking in the endless dark tunnel that there’s no light at all. Yesterday evening, after we read the bible and prayer together, my husband asked me to once again to open our bible and read 1 Samuel 30:1-25. This Bible passage tells the story of David facing very difficult situation but successfully came out as a winner in the very short time. At the time David and his troops reached Ziklag that had attacked and burned by the Amalekites. Although no one was killed, but the women and everyone else both young and old being captivate by the Amalekites. The problem wasn’t stop there. It is written that David was greatly distressed for the people spoke of stoning him, because the all people were grieved, every man for his sons and his daughters. (Verse 6a-b) My husband asked me to imagine David’s situation at the time. Not only the afraid of seeing the whole town burned down, not just sad to see women and children taken captive even his two wives, but he also had to face the people who are ready to kill him by stoning because they anger the enemies deprived their wives and children. David had to face the entire hard situation in the moment. Then my husband said, “Maybe David’s situation was similar with your current situation but let’s see what David’s reaction was and what he did to handle his problems. I strongly believe you will get something.” It turns out David wasn’t discouraged and faltered at all. He wasn’t disappointed to God though what he faced was extremely hard and didn’t know how to solve it all if he relying on his own strength. The bible very clearly says what David’s reaction was and what he did. That was the choice made by David as his reaction to all the problems he faced. What happened next was very incredible. From the dusk till the evening he was destroying the Amalekites. Except four hundred young men who fled by camel, there was no one of them escaped. Then all had carried away by Amalekites recovered successfully by David also rescued his two wives. (Verse 17-20) David was successful overcome the problems that came insistently. My husband asked me again to think deeper about what was David’s successful key. Then I got one big thing that made David successful overcome his problems. Although David was the king with many troops, he still realized that as human being he had many limitations and then he took the right decision. He decided to not rely on his own ability but he simply relies on God who has power above of all. He fully understood and believed that God’s power is able to overcome everything and he also was sure that there is nothing impossible with God. David strengthens his faith and belief to God. His life experiences formed him in such a way to have a very strong faith and really know exactly who is God. My beloved friends, maybe this time you have very hard time like me. Maybe our lives today is like “piano strings” and maybe it makes us disappointed, upset, frantic, angry, and confused. To digest the situation has been so difficult let alone to thinking about the solution. This evening please allow me to encourage all of us to always remember that we have God who really loves us. We have God as a place to rely on, always be with us, and will never allow us to suffer alone. Heavier the burden we face, harder the storm hit us it means we should be more aware to build relationship that hold strong in God. My problems not been completed and maybe so it is with you now. 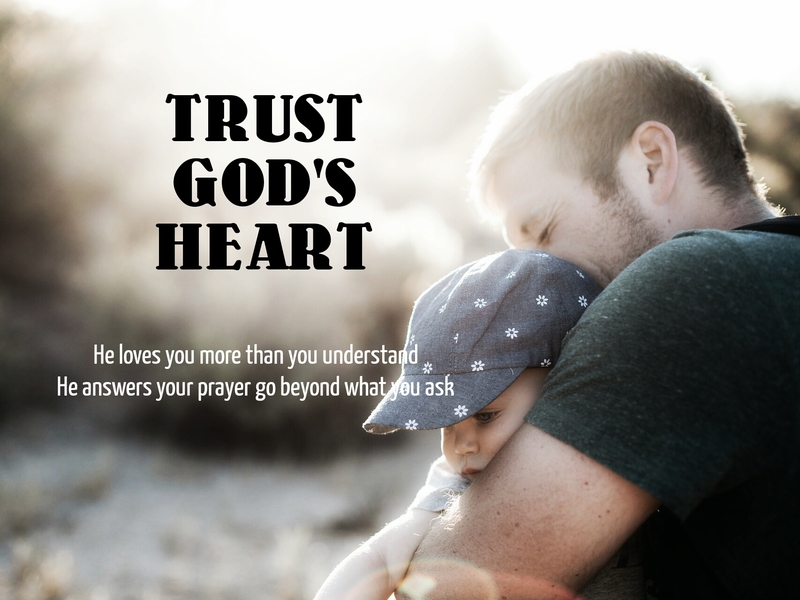 Maybe now we haven’t seen the answer of our prayers, but I encourage all of us to always remember and embed in the deepest of our heart that there is always answer from God and He will surely answer our cry. Like David did, let’s make “always lean on God” become our lifestyle. If this time we still have a lot of problems that difficult to be resolved, don’t be afraid and worry, hold our hands to God, cast all burden of life to Him, God will always be ready to lend a hand to help and guided us. 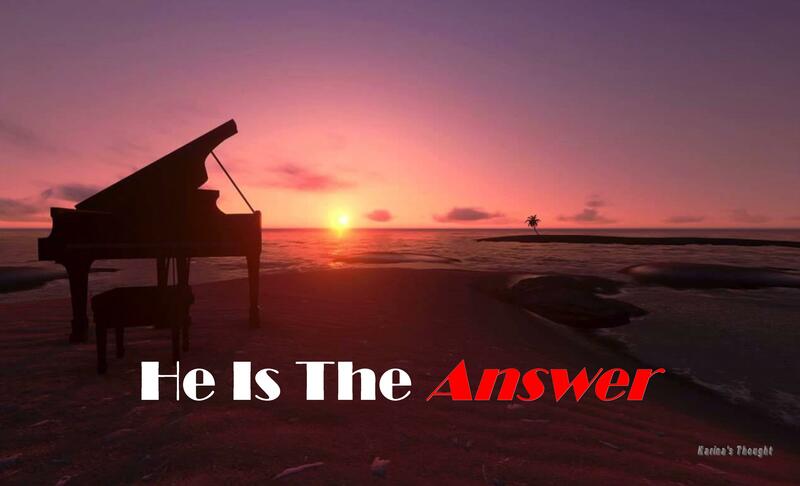 There’s always an answer in Jesus because He is the answer and like piano strings that produce a beautiful music notes, our lives will be beautiful because He has made everything beautiful in its time (Ecclesiastes 3:11) Amen.